How Do You Manage Risk With Time? There are many ways to manage risk. One way is with time. 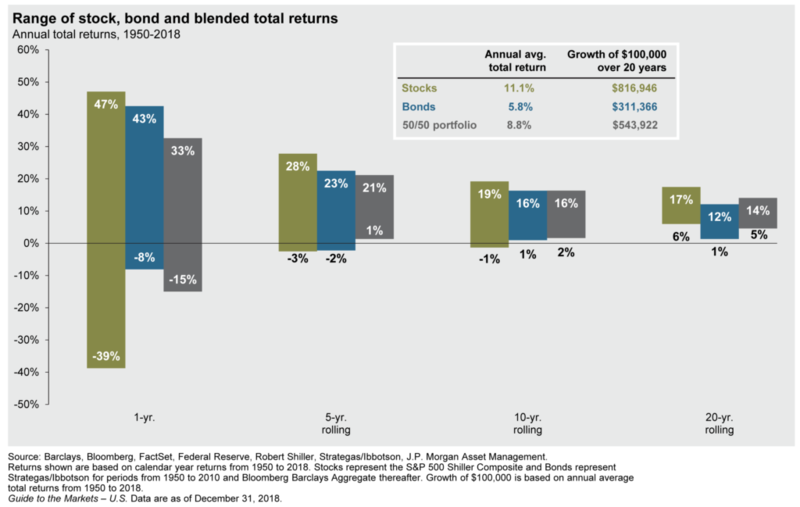 Take a look at the green bars in this chart, representing the range of investment returns for U.S. stocks from 1950 through 2018 (as represented by the S&P 500 Shiller Composite). On the left side of the chart we see that since 1950 the worst one-year performance for U.S. stocks was a loss of -39% and the best year for stocks was a positive return of 47%. That is a dramatic range. Now consider the 5-year rolling period. Notice how the range narrows significantly from -3% to 28% and how the risk of loss is significantly lower than any one-year period. If you invested in the worst 5-year period for stocks since 1950 your loss would only be -3%. When we look at the 10-year and 20-year rolling periods, the range of returns continues to narrow. From 1950 through today, a period of time that included several major market disruptions (the 1973 oil embargo, Black Friday, the tech bubble, and the Great Recession, to name a few), the worst 10-year period for the U.S. stock market resulted in a loss of just -1%. The worst 20-year period since 1950 resulted in a positive return of 6%. What we learn from the data is that time is an important consideration when we consider investment risk. If you plan to invest for a short period of time your risk of losing money by investing in stocks is significantly higher than if you have a longer time horizon. Structuring your investments with time in mind may help mitigate risk. Is it worth the risk to invest money in the stock market if you need that money in the next 12 months? Probably not. But what if you are investing money that you don’t need for 10 or 20 years- is it worth the risk of investing that money in the stock market? It may be. Talk to your Spotlight wealth manager about structuring your investment portfolio around your time horizon. Don’t avoid risk; use risk management strategies instead. What Is a Stock, What is a Bond, What is a Fund? 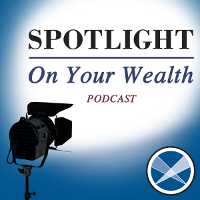 Jon Jamieson, Director of Trading at Spotlight Asset Group, explains what is a stock, what is a bond, and what is a fund in this episode of the Spotlight On Your Wealth Podcast. Episode: What Is a Stock, What is a Bond, What is a Fund? Aaron Kirsch: Hi, this is Aaron Kirsch, Managing Director at Spotlight Asset Group. Imagine yourself as a ship owner in the 1600’s in Europe, eager to sail to the East to take advantage of all the riches that trade had to offer. You are faced with a lot of risk from pirates, weather, and poor navigation. You are also faced with huge expenses outfitting your ship and crew for the long voyage. What if… what if you could get investors to put up money and share the risk in exchange for a piece of the profit if the voyage is successful? You give your investors stock in your shipping company. As investors start receiving huge dividends others want in on the action and want to buy shares in shipping companies like the British East India Company. Back then there were no regulations or stock exchanges to trade so many scam artists emerged to take advantage of investors which caused the English government to outlaw issuing s stocks. In 1790 The Philadelphia Stock Exchange became the first in the United States but the New York Stock Exchange, whose origins began two years later, soon became the dominant stock exchange in the US and the most important stock exchange in the world for almost two centuries. On this podcast we are going to talk about the basic mechanics of different investments- what is a stock, what is a bond, what is a fund, and how do you invest in them. Our guest today is Jon Jamieson, director of trading at Spotlight Asset Group. Even if you’re familiar with Spotlight, you may not know Jon. He works behind the scenes to make sure that all the trading at Spotlight goes smoothly. Jon, before we get started, please tell us a little bit about yourself. Jon Jamieson: Absolutely, so I’ve been in the industry for about 16 years. I started my career down on the floor of the Chicago Board of trade. I was down there during my undergrad and graduate days. I was working as a clerk on the agricultural trading floor where, instead of a stock like we’re going to talk about today, we were trading futures. After that I went on to work on a trading and execution desk specializing in futures options. I then moved over to Spotlight at its inception a little over a year and a half now so my role here is allocating and trading for all our client accounts and making sure that they are allocated correctly per their IPS agreement. So I’m happy to dive right in and discuss the life of a stock with you. Aaron Kirsch: That’s great Jon, thanks. So I described how the first stocks were created, but let’s pick a more modern example. Jon Jamieson: Sure. So let’s say Jack and Jill on a widget company and they probably started this widget company with either their own money or money from families and friends or private investment but as the company grows, they’re going to want to expand more. They’re going to want to add do lines of widgets, they’re going to want to build new factories, so they’re going to go out to the public to try and get that investment. The two ways they can do that is by issuing bonds, or what we can talk about first is issuing stock. So they’ll issue stock through an Initial Public Offering or an IPO. They’ll issue stock to investors in the public that will give investors the opportunity to invest in their widget company and be entitled to future earnings of the company as it grows. Aaron Kirsch: How does the stock become public? What’s going on there? Jon Jamieson: They go through a process of registering with an exchange like the aforementioned New York Stock Exchange and they create an IPO or Initial Public Offering in which analysts will determine what the value of one share of stock in the widget company should be and they will open it up to trading and investors can buy and sell at whatever price they deem fit. Aaron Kirsch: There’s usually a lot of excitement around IPOs. Some of these are tech companies that people have heard about forever and so the prices kind of get out of hand, right? There’s excitement. People want in on the IPO. Once the IPO starts trading people want to buy in. It shoots the price up dramatically. How’s all that work? Jon Jamieson: Right. Especially now there’s a lot of social media and you know there always has been a lot of media surrounding a lot of IPOs which leads to a lot of price action or a lot of price movement, meaning the price is not standing still very often in the initial trading. It’s kind of moving all over the place. It eventually will even out and become a normally traded stock but the media can definitely drive a lot of, some warranted some unwarranted movement in a stock price early on. Aaron Kirsch: Some of all this price movement is driven by uncertainty because we really don’t know how much the stock should be worth. These companies have been private up until now, so no one really knows what they’re making. Jon Jamieson: Right and it’s all based on potential. Do investors like the widget industry; do they like how Jack and Jill’s approach is to the widgets industry? Sure but there’s not a ton of information readily available yet compared to a well-established company so it’s harder to determine what a fair price for the stock should be. Aaron Kirsch: And usually when it’s a really hot IPO, everyone wants in and it’s really hard to get and then sometimes there’s companies that go public and they’re not very exciting. So my dad used to say, if you want it, you can’t get it and if you can get it, you don’t want it. All right, Jack and Jill Widget Company- they have their IPO and they’re now traded on a stock exchange. So now that they’re traded on a stock exchange, how does the stock price move up and down? Jon Jamieson: So basically what it is, is an auction market. The stock is always up for auction. There will always be people wanting to buy and there will always be people wanting to sell so there’s always going to be a bid by those people looking to buy and there will always be an offer by those looking to sell and where those two meet is where the stock will always be trading. Aaron Kirsch: Right it’s an auction market, so if there’s a lot of excitement about a company because their profits are really good, their potential is really good, there’s going to be more people wanting to buy into that company than there are people willing to sell it. That’s going to push the price up. And then if the company doesn’t have good earnings or might go bankrupt, then there’s going to be a lot of people wanting to sell that stock and not a lot of buyers and that’s going to push the price down. Aaron Kirsch: And all this is done on a stock exchange so what exactly Jon is the Stock Exchange doing? Jon Jamieson: Sure, so the stock exchange, while back in 1790 as you were saying that it was a physical building where there were people matching up buying and selling on the trading floor. It is now, for all intents and purposes, a large network of computers that is run by say the New York Stock Exchange and that facilitates the buying and selling, matching up buyers and sellers of stock, and allowing them to trade freely. Aaron Kirsch: If you’re a shareholder of Jack and Jill’s Widget Company, what are some of your rights? Jon Jamieson: Primarily the number one thing that you’re entitled to is the company’s earnings. Now how you gain access to those earnings can vary. Some companies are dividend paying companies, so every quarter they have earnings and they pay a certain percentage of those earnings to their investors. Normally a set amount based on the number of stock that each investor has. There are also non-dividend paying companies. They take their earnings and reinvest it in the company. Now you might say, well, I’m not getting a dividend, it’s not as good for me, but theoretically the earnings going back into the company should be increasing the stock price, the value of the company, and making your investment go up as well. Aaron Kirsch: Back to Jack and Jill’s Widget Company, they make some money and they can decide we’re going to take some of that money and pay it out to our shareholders, let them share in the profits. Or they can say, we’re going to take that money and we’re going to build a new factory or invest in a new product line to grow our company even more. Jon Jamieson: Exactly. The first thing is a dividend and the second one is reinvestment, which would lead to a higher stock price and better value in the investment for their investors. Aaron Kirsch: If all things go well? Jon Jamieson: Correct, if all things go well. Aaron Kirsch: Jon, investors get proxies in the mail and they don’t know what to do with them. What exactly is a proxy? Jon Jamieson: A proxy refers to basically a vote for every one share of stock that an investor owns. Companies have decisions that need to be put to a vote from all of its investors and so what a proxy does is it guarantees every investor a vote in say, whether or not to issue a dividend, whether or not to have somebody on the board directors. Basically a proxy allows every investor to have a say in how the company is run. Aaron Kirsch: It’s not like electing the President of the United States where there’s one vote for every person. Uou get to vote based on your shares. So if you have a hundred shares of Jack and Jill’s Widget Company and there are a million shares outstanding, you’re 100 shares isn’t going to influence things very dramatically. Jon Jamieson: Correct. The larger the holding, the more shares you own, the more say you have in the effect of the vote. In principle it’s good to participate. If you’re an investor in the company you should say that you have some sort of say in how the company is run and what decisions they make. Aaron Kirsch: We talked a little bit about the New York Stock Exchange and stocks that are listed on that stock exchange are usually vetted by the New York Stock Exchange. There are certain criteria that these companies have to fulfil. They have to have special reporting, they have to have a legitimate business, but there are other exchanges out there. Jon Jamieson: There are. There are other companies out there that don’t meet the criteria of the New York Stock Exchange. They are sometimes known as penny stocks, which are traded not on the New York Stock Exchange, but something that’s called Over-the-Counter. There is less regulation, there is less liquidity, it’s a little bit riskier and kind of like the IPO. This is based almost solely on hype and is media driven so people will invest in penny stocks hoping that the hype will drive the stock price higher exponentially and then they’ll be able to get out quickly. Aaron Kirsch: But because the requirements are a lot less, they tend to be pretty risky. Jon Jamieson: That’s correct. They are a lot more volatile and sometimes if you get into them, because they are traded Over-the-Counter, it can be harder to get out of your investment as well at a price that you want to. Aaron Kirsch: Okay now we’re going to talk about the other way Jack and Jill Widget Company can raise money besides issuing stock. You had mentioned they can also issue bonds. What’s a bond? Jon Jamieson: A bond is basically an investment in a company’s debt. An investor can buy a bond from Jack and Jill’s Widgets and for that investment, Jack and Jill will pay them interest. They will pay them a fixed amount over the life of the bond as opposed to a stock where the amount you’re going to make back is volatile and not set in stone. With a bond you’re going to make a fixed interest payment back over the life of the bond. It’s going to be the same amount every time. Aaron Kirsch: A stock, you actually own the company and you participate in the fortunes of that company. A bond is an I Owe You to the company. You’ve lent them money that they’re going to pay you back at some point in the future. Jon Jamieson: Right and the interest payment that you receive from the company on the bond is predicated upon the chances of the company being successful in the future. So a company that is very well established, should have a bright future ahead of it, its interest payment is not going to be as high as one that is slightly more risky and not as sure to pay back the final bond payment at the end of it. Aaron Kirsch: And those risky company bonds are known as? Jon Jamieson: Junk or high yield bonds. Aaron Kirsch: Right. Junk bonds because they’re from companies that aren’t as solid, but the euphemistic term is high yield because those companies are going to have to pay a higher interest rate to investors in order to entice investors to take that risk, right? Jon Jamieson: Correct because it’s less likely that the company will still be around at the end of the bond’s duration. Aaron Kirsch: Great. Now let’s move on to other kinds of investments. We talked about stocks, we talked about bonds, let’s talk about funds. Jon Jamieson: Okay great. There are two major types of funds that most investors might be familiar with or hear a lot. Those are mutual funds and exchange traded funds or ETFs. If you invested with Spotlight odds are you probably own at least a couple ETFs. So basically what they are, if we could go back to our Jack and Jill example, say you like the Jack and Jill’s widgets, but you like the widget industry in general a little bit more and you don’t want to be tied to just one widget company’s stock performance. So you could buy a widget ETF or exchange traded fund and what this fund does is it gains you exposure to all the widget companies on their performance. So if the widget industry as a whole does really well, that price will do really well, but it is not as susceptible to a large drop or a large gain by just one individual stock. Aaron Kirsch: There are industry specific ETFs like the widget industry. What other kinds of ETFs are available? Jon Jamieson: In addition to certain industries, there are also certain countries or parts of the world. You could do emerging market ETFs. There are international ETFs. There are ETFs that track only large cap or medium cap or small cap companies here in the US or abroad, and then there are also things like energy ETFs or a real estate. Basically the ETF industry is growing by leaps and bounds. There’s really an ETF for any type of sector or investment that you’re looking for. Aaron Kirsch: And these ETFs, or exchange traded funds as we mentioned, tend to be low cost which is why a lot of people like them. They tend to be a lot lower cost than mutual funds which were their predecessors. Let’s talk a little bit about mutual funds. Why are mutual funds more expensive than exchange traded funds? Jon Jamieson: To put it simply, an ETF is a basket of every company in a certain industry and the allocation to the company stays constant, whereas a mutual fund is a basket of different companies in an industry but it’s constantly changing per the analysis of the mutual fund manager. The mutual fund manager is always adjusting the allocation of the fund to try and capitalize on where he feels different companies are headed in the future and will change the allocation of the fund accordingly. What comes with that however is he will charge a higher fee to invest in the fund itself. Aaron Kirsch: Typically exchange traded funds don’t have a manager, it’s just a buy and hold strategy. We’re going to just pick a basket of stocks and hold them. Whereas the mutual funds, they have an investment management team that is tracking different stocks, is looking at and analysing these companies, is trying to pick winners and losers and it’s constantly making changes, so you have to pay for that management. You have to pay for that research team to try and make those changes within the portfolio. Jon Jamieson: Exactly. Mutual funds have a finer touch on how they are managed but you do pay for it. Aaron Kirsch: And just like exchange traded funds where there seems to be an exchange traded fund for just about anything you want, whether it be industry specific, country specific, company’s size specific- there’s the same thing for mutual funds. Jon Jamieson: ETFs are probably more popular of late, but both spaces are incredibly large and can provide exposure to any type of investment you’re looking for. Aaron Kirsch: Those don’t have to just be stocks. There are mutual funds and exchange traded funds that do invest in stocks. There are funds that invest in bonds. There are funds that invest in real estate, alternative investments…. There are so many mutual funds. I think there’s more mutual funds than there are stocks available to invest in and the exchange traded fund universe is growing dramatically too. Jon Jamieson: Correct. It can be daunting but there’s great tools out there to help us vet these funds and find the ones that are worthy of investment. 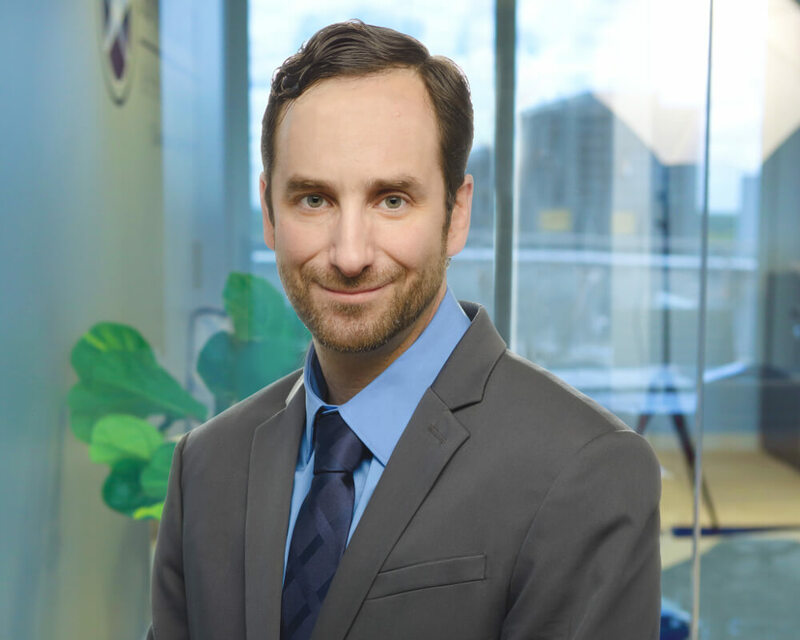 Aaron Kirsch: Which is one of the things we do at Spotlight, which is the investment management, helping find the right investments for our clients. Jon, thank you for sharing your knowledge with us today on the podcast. Jon Jamieson: My pleasure Aaron. Anytime. Aaron Kirsch: If you have questions about what we discussed today or any other questions about investments, please contact your wealth manager at Spotlight Asset Group. For Jon Jamieson and the rest of the team at Spotlight Asset Group, this is Aaron Kirsch. Thanks for listening. Our podcasts are intended to provide general information about our business, not to provide investment advice or solicit or offer to sell our investment advisory services. You should not make any financial, legal, or tax decisions without consulting with a properly credentialed and experienced professional. Any specific situations we reference in our podcasts are for illustrative purposes only and should not be construed as a testimonial, and any mention of past performance is not a guarantee of future success. “Escalator up, Elevator down” is a good metaphor to describe movements in the stock markets. On September 20, 2018 the S&P 500 Index peaked at 2930. The index gained approximately 17% over the previous 12-month period. It took only three months to wipe out that gain. We can sometimes forget that stock markets are volatile (as described in detail in our October 30, 2018 post That Was Fast! by Stephen Greco, CEO). 2018 was an average year for volatility but it seemed worse because 2017 was unusually calm. The standard deviation (a measurement of volatility, for those of us who didn’t fall asleep in statistics class) for the S&P 500 Index from 1926 – 2017 is 18.7%; in 2017 it was a mere 6.7%. It can be a challenge for us to ignore short-term fluctuations with around-the-clock investment news but it is important to keep your focus on long-term results. Speak with your Wealth Manager about how volatility affects your investment portfolio and your long-term financial plan. This scam involves fake emails or websites in which criminals attempt to steal personal information. Scam emails and websites can also infect a taxpayer’s computer with malware. Avoid opening emails or clicking on web links claiming to be from the IRS. The IRS does not initiate contact with taxpayers via email about a bill or tax refund. Do not click on links or download attachments from unknown or suspicious emails. The IRS has seen a surge of phone calls by criminals impersonating IRS agents who threaten taxpayers with police arrest, deportation, license revocation, and other penalties. They demand cash through a wire transfer, prepaid debit card, or gift card. The IRS does not initiate contact with taxpayers via phone and never calls to demand immediate payment using a specific payment method. The IRS typically will first mail a bill to any taxpayer who owes taxes. The IRS does not threaten to bring in law enforcement to arrest you for not paying. The IRS cannot revoke your driver’s license, business license, or immigration status. Taxpayers need to watch out for identity theft at all times, and during tax time when some criminals file fraudulent returns using someone else’s Social Security number. Always use security software on your computer with firewall and anti-virus protections, and use strong passwords. Learn to recognize and avoid phishing emails, threatening phone calls, and texts from thieves posing as legitimate organizations such as a bank, credit card company, or government organization (including the IRS). There are groups masquerading as charitable organizations that solicit donations from unsuspecting contributors. Many of these fake “charities” use names similar to familiar or nationally-known organizations. Take a few minutes to research an organization to ensure your hard-earned money goes to legitimate charities. The IRS website has tools to check out the status of charitable organizations. We all have our favorite charities and some of us are fortunate enough to support those charities financially. Because of certain rules in the tax code there are typically better alternatives than writing a large check. Let’s look at two specific strategies. Gifting stock that you have owned for more than one year and that has gone up in value is a great way to avoid capital gains taxes and support a non-profit organization. And if you itemize deductions you can take a charitable deduction for the stock’s fair market value on the day you give it away. Let’s say you bought a stock for $4,000 ten years ago and it’s now worth $10,000. If you sold that stock and paid 20% Federal capital gains tax on the $6,000 of gain your tax would be $1,200. You would receive $10,000 from the sale of the stock, minus $1,200 in capital gain taxes, netting you $8,800 which you could then donate to your favorite charity. But if you gifted that stock to the charity then the charity, being a not-for-profit organization that does not pay taxes, would sell the stock and net $10,000 in proceeds from the sale. Neither you nor the charity would pay capital gains tax. That’s $1,200 more to your favorite charity. That makes a lot more sense than just writing a check, doesn’t it? If you donate to charitable organizations and are taking required distributions from your Individual Retirement Account, you should consider making donations directly from your IRA. The tax law passed by Congress in 2017 doubles the standard deduction and limits itemized deductions for state and local property taxes to $10,000 (which affects many taxpayers in states with high property taxes and state taxes). This means that you may not be itemizing your deductions in 2018 and therefore not receive any deductions for your charitable contributions. A “Qualified Charitable Distribution” allows anyone who is 70 ½ or older to donate money directly from an IRA to a charitable organization without that gift counting as income (up to $100,000 per year). Any money you transfer through a Qualified Charitable Distribution counts towards your required minimum distribution (the charity must cash the check by December 31). For example, a client could make an annual gift to his or her alma mater directly from an IRA. Or a couple who donates regularly to their church could set up monthly distributions directly from an IRA. That way, instead of taking money out of the IRA and paying taxes before making the donation, they can send the funds directly to their favorite charities without having to pay taxes on an IRA distribution. Another benefit of a Qualified Charitable Distribution is that it reduces your Adjusted Gross Income (AGI) which determines how much of your Social Security is subject to income taxes and determines the amount of your Medicare premiums in the following year. There may be better ways than writing checks to support your favorite charity. Consider gifting stock and making donations directly from your IRA. Please contact your Wealth Advisor at Spotlight Asset Group or consult with your accountant to discuss these and other charitable giving strategies.